London is the capital of the United Kingdom and one of the world’s oldest and largest cities. It is Great Britain’s economic , cultural and political centre. Its sights attract millions of tourists every year. London lies on the River Thames , about 50 km from the North Sea . The river has influenced London for many centuries . Rising tides have flooded the city more than once. In the 1970s and 80s a large barrier was built in the eastern part of the city to stop incoming water from flooding the nation’s capital. The City is London’s financial district and the oldest part of the capital . It is very small, with a size of only one square mile. Although only a few thousand people live here , hundreds of thousands pour into the City every day to work in the big office buildings of large banks and other institutions. The West End includes London’s government district Westminster as well as the famous shopping streets around Piccadilly Circus and Trafalgar Square. The city’s famous cinemas, theatres and bars are located in the West End. Most of London’s tourist attractions are concentrated here. The South Bank is the area south of the Thames River. It is a cultural district with many concert halls, museums, theatres and galleries. London is a multicultural city. In the 19th century thousands of people began pouring into London as a result of the Industrial Revolution. At the beginning of the 20th century immigrants from other European countries came. In the 1950s and 60s people from Britain’s colonies came to London. Indians , Pakistanis and West Indians are a common sight in the city today. About 25 % of London’s population are immigrants or the children of immigrants. London has a 2000 year old history. In the first century A.D. the Romans came to Great Britain and founded a settlement near the mouth of the River Thames . They called it Londinium. After they left London about four hundred years later the Saxons, a Germanic tribe , settled in the area. In the centuries that followed Vikings repeatedly attacked the city . When William the Conqueror invaded Britain in 1066 London was already the biggest town on the island. William made the city its capital and crowned himself king in Westminster Abbey on Christmas Day. He also built the Tower of London to protect the city from invaders . During the Middle Ages London grew steadily . It became one of Europe’s trading centers and its population grew to about 200,000 by the beginning of the 17th century . Then disaster struck the city twice. The Great Plague of 1665 killed about a fourth of the city’s population. A year later the Great Fire burned down most of the older part of the city. After this tragedy the city was rebuilt with houses made of stone and brick instead of wood. At the beginning of the Industrial Revolution almost a million people lived in London. It was the largest city in the world and the centre of the British Empire , which, at that time was growing at a rapid pace . As more and more people moved to the city from the countryside London needed more and better transportation systems. In 863 it became the first city in the world to start an underground railway system . During the Second World War Nazi Germany bombed London heavily . 30,000 people were killed. The rebuilding of the city after World War II caused many problems. City planners did not want London to grow endlessly in all directions. A green belt was created around the city to stop its expansion . Outside of this green area new towns emerged . They became small cities which many people moved to later on. In the second half of the 20th century London faced many problems that other megacities also have: air pollution, traffic jams and unemployment . In the 1970s and 80s the Docklands in the eastern part of London were rebuilt. They were once part of the world’s largest harbour . The Docklands lost their importance as the British Empire lost its colonies. In the past decades new office buildings , shopping centers and a new airport have been created in an attempt to revitalize this region. London is the UK’s main economic and financial centre. It is the centre of trade and banking. Factories around the city produce all kinds of consumer goods —from clothes and electronic products to food and chemicals. Trading companies were founded along the Thames river at a time when Great Britain was still the biggest colonial power in the world. Docks and wharfs in eastern London became the centre of world trade. New container terminals were built in the 60s, in order to handle the larger cargo ships that come to London. 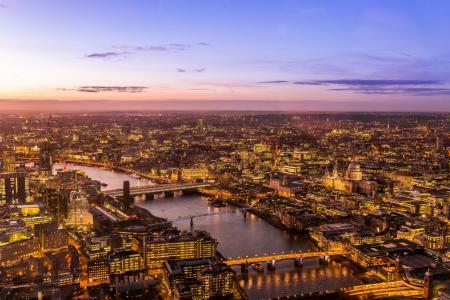 London is Europe’s most important banking and financial centre. Almost all of the world’s large banks have regional headquarters in London. The Bank of England, located in the City of London, controls the country’s money supply and is responsible for the value of the British pound sterling. Tourism is an important economic factor for the city. Every year millions of people from all over the world come to London to see the city’s well-known sights. Pupils and students from all over the world come here to learn English or to take language courses. Over 200 000 Londoners work in tourist related industries. As Europe’s gateway overseas London has two big international airports. Heathrow, in the western part of the city, is the main airport for international flights. Gatwick, halfway between London and the southern coast was opened in 1958 in an attempt to get some of Heathrow’s traffic away from the city. Stansted, in the north of London, handles regional flights and flights of budget airlines . London’s new City Airport is only 15 minutes from the city centre and is used especially by business travelers. There is probably no other city in the world that has such a dense public transport system than London. The Tube, London’s underground railway, is the oldest in the world. The red double-decker buses are well-known around the globe and a symbol of inner city transportation. All together, about 5 million people use London’s public transport every day. London has 6 railway stations that handle over 1.5 million commuters who travel in and out of the city every day. Fast trains from Paris and Brussels arrive in London daily through the Channel Tunnel. London is well known for its museums, art galleries and concert halls. The British Museum is one of the oldest and largest museums in the world. It contains over seven million artifacts from all continents, cultures and civilizations. The National Gallery, situated on Trafalgar Square, is home to a great selection of European paintings. Tate Gallery has works of British and modern art. London’s theatres perform works of Shakespeare and other great dramatists. The Royal Opera House at Covent Garden is host to performances of London’s big orchestras. London - procvičte si četbu v angličtině. Článek o Londýně v angličtině - procvičte si četbu v anglickém jazyce. Geografie, historie, památky.